For specific themes or issues, as its own initiative or on demand, FERSI can install a dedicated working group. The output can be a scientific paper or report with the latest knowledge on a specific issue, a position paper on new developments and related research gaps, or an advise on current policy issue or research needs. Previous FERSI working groups dealt with a variety of topics including vulnerable road users, vehicle automation, serious injuries, road safety economics, road safety management, and safety performance indicators. Currently, there is a working group active on smartphone distraction, led by BASt, Germany. The aim is to develop a joint scientifically valid research method for assessing the prevalence of different aspects of smartphone use of car drivers, cyclists and pedestrians in a variety of traffic circumstances. FERSI as an organisation or a group of FERSI members publish research reports, scientific papers, position papers and advises. 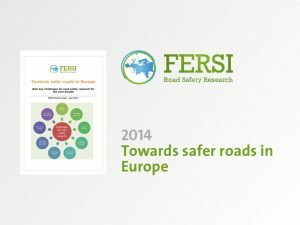 At the basis of FERSI’s work is the 2014 position paper ‘Towards safer roads in Europe‘. This report describes the nine key challenges for road safety research for the next decade: Ageing society, Vulnerable road users, Cultural diversity, Vehicle automation and ITS, The burden of injuries, Safe road design, Educating & training road users, Behavioural change, and Road safety management. 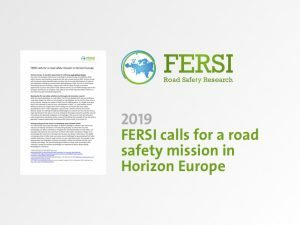 FERSI calls for a road safety mission in Horizon Europe. FERSI statement for EC officials, national contact points and road safety organisations. 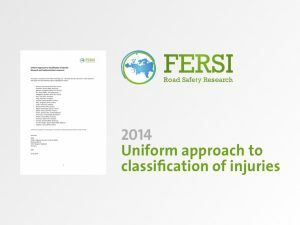 In this short document FERSI clarifies and substantiates the need for further research and innovation in the area of road safety in order to meet the ambitious European objective of halving the number of road fatalities and serious injuries in the next decade, and having a road without victims in 2050. This paper discusses the key questions related to traffic safety, automated driving (AD), connectivity and intelligent transport systems (ITS). The paper first gives a background to the problem and then lists a number of questions which are of primary concern to FERSI, and which have implications for traffic safety. The paper ends with a FERSI Code of principles for ‘Safety through automation’. 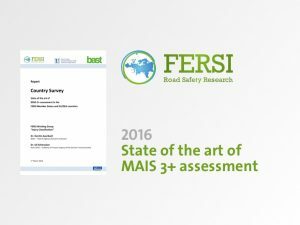 This document reports on the results of a survey among European countries in order to increase our understanding of the state and methods of the MAIS assessment, and the actual handling and storage of injury data in hospitals, and to identify possibilities and hurdles for combining MAIS diagnoses and police accident data or other indicators. Existing and planned efforts in injury surveillance, prevention and analysis like IRTAD, CARE or JAMIE build a solid background for implementing the European objective of reducing the number of serious road traffic injuries. Additional more target-oriented activities are needed, including harmonization of definitions, quality of measures, and implementation strategies. This paper summarises the relevant activities necessary to complete the ongoing efforts. FERSI has identified nine key challenges and related research questions that are important to address, if Europe wants to succeed in its ambition to improve road safety and reduce significantly the number of crash victims. These challenges are briefly outlined in this paper.